Got to start this blog post by asking that people please take care when swimming in the ocean in the low season. 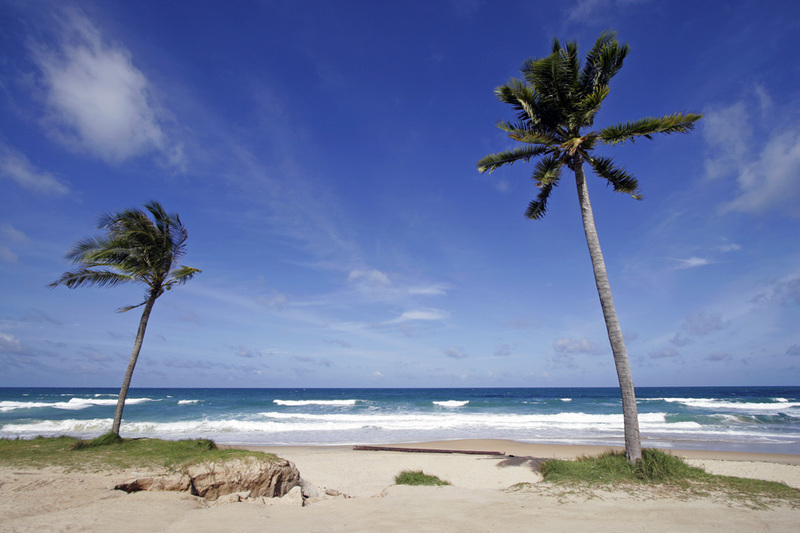 There have been a couple of drownings this week at Karon Beach. Apparently beach guards have been asking people to not swim, but dammit we're on holiday, we're going to swim in the sea! I have driven along Karon Beach road several times in the last week and seen the waves at the beach. I am (or was!) a scuba instructor. The sea holds no fears for me, but you wouldn't catch me swimming at Karon Beach when it's blowing 15 - 20 knots. I wrote about this in June : Please don't drown in Phuket. Weather since previous update... Mostly sunny, a bit cloudy, hardly any rain (3 or 4 days with no rain, but had some yesterday). But WINDY - a bit rough out at sea, big waves at the beaches. Good weather for anything except a swim in the sea. Good weather for a boat trip to James Bond Island, or a nice seafood lunch, or a cycling tour, or a visit to Chalong Temple or the Big Buddha... and much more! Noticed one of many weather threads on TripAdvisor, where someone said "Arrived back this morning, having spent 10 days there. Apart from a little drizzle as we were leaving yesterday afternoon, we only had one wet day - very kind indeed!" - Low season can be kind, yes. But not guaranteed! On the 7th (Saturday) I had a quick walk in Phuket Town. A slightly cloudy afternoon is good for exploring the old town, as it's not so hot. 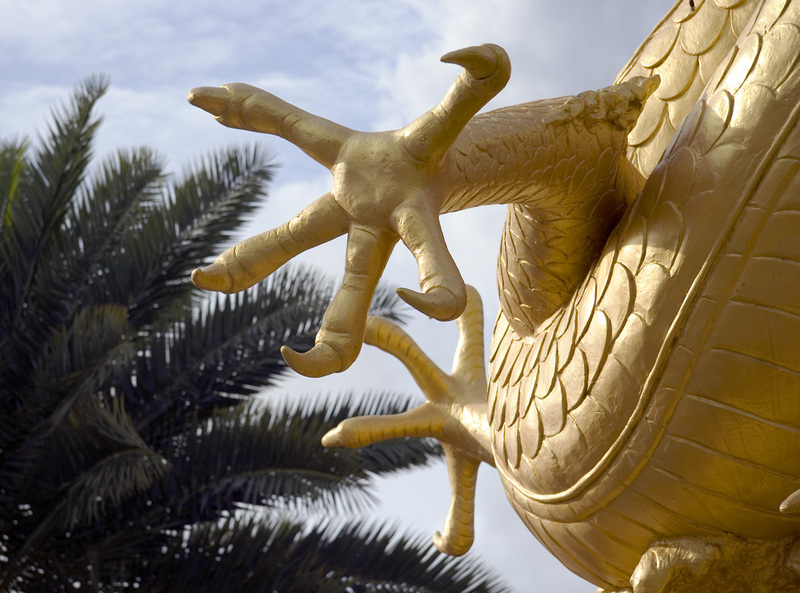 I wanted to test my camera, just back from the Canon service in Bangkok with a shiny clean sensor. 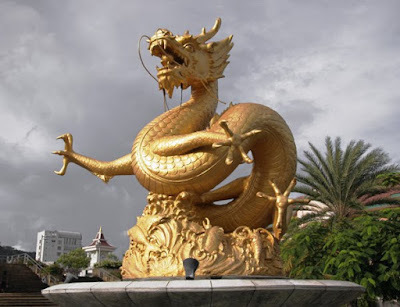 There's a big dragon statue at the south side of Queen Sirikit park, next to the TAT offices. It's just a block east of the old town but I don't walk this way much. 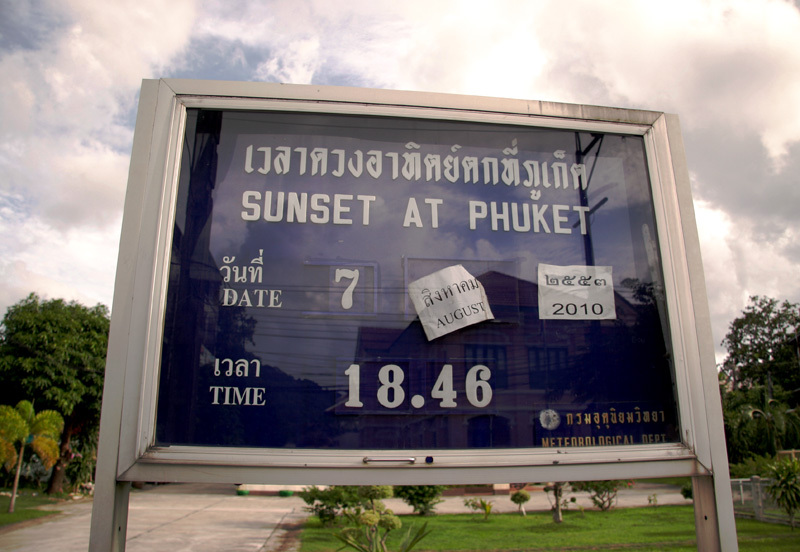 A handy sign can be found outside the Phuket Meteorological office which is opposite the TAT office. Sunset on Saturday was apparently at 6:46pm. Sunday morning, I stopped at Karon Beach to try and get a photo of waves and palm trees bending in the breeze. Waves don't look so big in the photo but I assure you I'd not want to swim. Then on Sunday evening, football! No, I'm not talking about Chelsea and Manchester United playing the Charity Shield or whatever they call it these days... A friend suggested we go to watch Phuket FC, something I had planned to do this season. Evening was balmy, no sign of rain, kick off 6pm, so I headed to the stadium from work. Will write more on Jamie's Phuket later. Phuket beat Hat Yai 2 - 0. Forecast. More of the same. Which means.. some sun, some rain, some wind, some snow, some nice days, some grey days. It's weather. Can't live without it.